Imagine your guitar technique, speed, fretboard visualization, and creativity all improving after practicing just 1 exercise. The answer is: Yes and no. Yes, you need more than one exercise to fully master each guitar playing skill. Know what to focus on (and how to focus the right way) when you practice. Have an efficient guitar practice schedule that helps you squeeze maximum progress from every minute of your practice time. Step 1: Pick an exercise (or guitar lick) that is hard to play. It is challenging to play cleanly and fast. It requires you to use both hands to play the notes. It’s ok if some of the notes are played with hammer ons and pull offs, but most of the notes need to be picked. Step 2: Play your exercise 10 times in a row, focusing on your picking hand technique. Efficiency of your motions. You should not move the pick any more than absolutely necessary to play the notes. This is key to playing guitar really fast. The way your pick moves on string changes. Use directional picking to change strings. This means always play a downstroke when you move to a higher (in pitch) string and always play an upstroke when moving to a lower (in pitch) string. Unwanted string noise control. Listen for any noises that you don’t want to hear and mute them with your picking hand. Learn how to make your guitar practice fun and enjoyable. your own guitar practice routine. Step 3: Repeat your exercise 10 times, focusing on your fretting hand technique. Finger independence - this means to only move fingers that are supposed to be fretting notes. Keep the other fingers as still as possible. Efficiency - this means to fret notes using your fingertips (instead of the pads of your fingers). Do not move your fingers any more than absolutely necessary to play notes. Step 4: Repeat your exercise 10 times, focusing on fretboard visualization. Fretboard visualization is the ability to see all the notes, scale shapes, chords, and intervals in any key all over the guitar neck. Move your exercise to another key. For instance: if you are playing a lick in A major, transpose (move) it to D major, B major, Eb major, etc. Move the exercise to another mode. For instance, move the lick from the key of A major to A Aeolian, A Lydian, A Dorian, A Phrygian, etc. Move the exercise to another area of the fretboard, but keep it in the same key. This means to shift to a different position of the scale without changing keys. 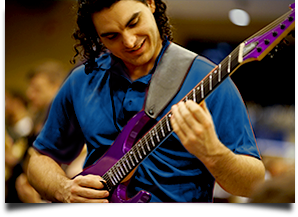 Tip: Schedule time for fretboard visualization practice on a regular basis in your guitar practice schedules. Step 5: Repeat your exercise 10 times, focusing on excess tension control in your body. Excess muscle tension is the killer of your guitar technique. It makes playing guitar much harder than it should be and causes you to make more mistakes. To release excess tension, focus on relaxing various parts of your body that aren’t needed to play guitar, such as: your shoulders, jaw, stomach, feet, thighs, calves, forearms and biceps. Step 6: Repeat your exercise 10 times, focusing on creativity. The easiest way to make your lick more creative is to change its phrasing. To change the phrasing, articulate and ornament the notes in different ways. Change the rhythm of your lick. Most guitarists play licks with very similar rhythms (consisting of straight 8th notes or 16th notes). When you vary the rhythm, you instantly sound more creative, even if you don’t change the notes. Bonus tip: use rubato to build massive musical tension in your guitar playing. To play with rubato means to play notes without a clear rhythm. You speed up and slow down at unexpected moments to build musical tension. Watch this guitar solo lesson to learn how to use rhythmic variety to play awesome guitar licks. Combine your guitar lick with other licks, or rhythm guitar riffs. Each time you go through this step, select a different way to practice your creativity for 10 repetitions. Step 7: Repeat your exercise 10 times, focusing on your picking hand articulation. Hit the strings hard enough to articulate the notes clearly. Make sure that your upstrokes are just as clear and articulate as your downstrokes. Step 8: Repeat your exercise 10 times, focusing on your 2-hand synchronization. When your hands are in sync, you pick and fret every note at the exact same time. This is key to making your guitar playing sound great at any speed. Tip: to make your synchronization tighter, make your articulation as strong as possible. This forces your hands to be in perfect sync for every note. The stronger your picking articulation is, the easier it becomes to keep your hands in perfect sync and increase your guitar speed. Step 9: Repeat steps 2-8 for 10-20 minutes. Practice this drill 2-4 times per week. The more you repeat these steps, the better you become in each of the musical skills you focus on. Answer: When you practice this drill, you rotate your focus from one area of your guitar playing to the next very quickly. This helps you avoid mindless practicing and makes every second of your guitar practice time count. When you focus on the same skill for an extended period of time, it’s easier to become bored and develop bad habits without realizing it. The next step to becoming a great guitarist is to create an effective practice schedule that helps you get better fast, even if you have little time to practice your guitar. Take this free guitar practice test to learn how to improve your playing fast and make your friends wish they could play guitar like you. Use the best guitar practice schedules to become the guitar player you’ve always wanted to be.